Judy Gabriel, left, with 90-year-old midwife Lena, who is wearing the new dress Judy brought her. Sipping homemade chai tea and munching on a homegrown persimmon on a beautiful fall morning, Silverton doula, childbirth educator and author Judy Gabriel reflected on a question about her work of the past two decades. Transitioning from assisting women in labor and childbirth, Gabriel is giving women another gift. Her book, Touching Bellies, Touching Lives: Midwives of Southern Mexico Tell Their Stories, is drawing praise for its insight, as well as for giving a voice to the rapidly-disappearing traditional midwife in rural Mexico. Her story – and the story of her book – requires a little context, as not everyone is familiar with the word doula. “The doula movement has been alive in the U.S. for over 20 years, but most people have never heard of it,” Gabriel said. “Young women giving birth in the U.S. have heard of doulas by reading books and taking childbirth classes. Gabriel said a doula’s knowledge of positioning and movement can help move labor along and make the woman not only more comfortable, but more able to realize the type of birth experience she desires. As the birth process became more “medicalized,” the use of doulas and midwives has provided a needed dimension in childbirth for many women. Gabriel went through doula training 20 years ago. At that time she and her husband Jim lived across the street from Silverton Hospital. 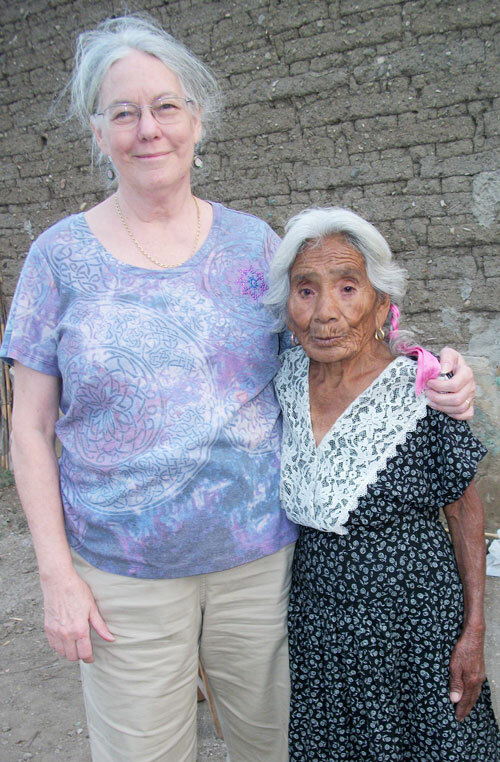 She began by volunteering to help Spanish-speaking women in labor. Also available at Silver Falls Library. While the hospital staff may not have been familiar with the work of a doula, Gabriel says they appreciated her fluency in Spanish and were happy to see their patients receive emotional support from someone who spoke their language. “The nurses, midwives, and doctors I worked with during those early years were my greatest teachers,” Gabriel said. Most of Gabriel’s work was as an unpaid volunteer, but eventually she created a website and took on paid clients. During the long hours and sleepless nights Gabriel spent with mostly Mexican women in labor, she began to wonder about what “natural childbirth” was and what we might learn about it from indigenous cultures. “I have worked with Mexican women, pregnant and birthing women, for the past 19 years. Being with women in labor is hours and hours of killing time between contractions, and talking about life in their villages. I also taught birth classes in Spanish for the hospital for 17 years. The families that I met, I asked them about their mothers’ labors and their own labors (before coming to the States), and that aroused in me real curiosity about the midwives, the women who had attended births for centuries. Her curiosity evolved into a passion to tap into the wisdom of traditional midwifery. It was aided by Gabriel’s long affection for Mexico and the Mexican people, which began with her first foray into rural Mexico as a 19-year-old volunteer for the American Friends Service Committee. “I was kind of imprinted by that trip,” she said. “It was my first trip out of the Midwest. Maybe if I had gone to Paris at that age, instead of rural Mexico, I would have ended up writing a book about French fashion instead of one about childbirth in Mexico. While Gabriel says some of her preconceptions turned out not to be accurate, Touching Bellies, Touching Lives is filled with fascinating stories of the midwives Gabriel met. Descriptions of traditional practices – like the belly massage of the book’s title – are intertwined with incredible tales of life in Mexico and Gabriel’s search to find these women and capture their stories before it is too late. Most of the midwives are old, and they are not being replaced. Mexico is adopting a medicalized approach to childbirth and medical professionals are leaving behind a tradition that is often derided as some sort of witch doctor mumbo-jumbo. Mexico has a 50 percent Caesarian rate. Touching Bellies, Touching Lives would be valuable even if it were simply anthropological research on a fading way of life. But Gabriel uses the book to explore profound issues related to modern beliefs and practices related to pregnancy and birth. Her extensive experience with childbirth as a doula helps her give context to the stories and traditional wisdom from the midwives, known in Mexico as parteras. Gabriel believes the midwife stories tell us that women seek other women to help them during labor. Many of the Mexican midwives began the work because other women came to their doors and said, “You have to help me.” Gabriel’s theory is that women who are soon to give birth seek out other women to be with them.